The first science fiction (SF) book I read was a middle grade book that Andre Norton wrote with Dorothy Madlee. Star Ka’at was about intelligent aliens who look like cats. It was my gateway book into science fiction. I was twelve, and Andre Norton was the only SF author my mom let me read, because she wrote clean stories. I’ll get to the tribute part soon. 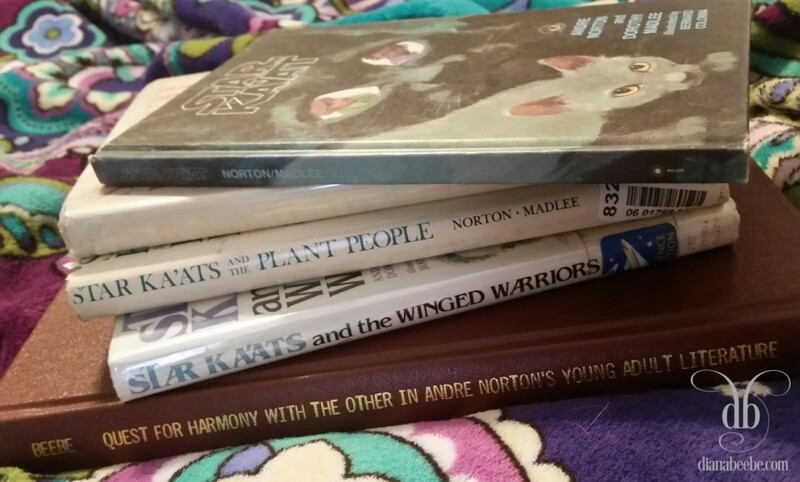 The out-of-print Star Ka’atz books I tracked down and a copy of my 1995 master’s thesis about Andre Norton. And I read her books. As many as my parents had on their shelves. I fell in love with the genre that could tackle subjects that no one else was talking about then (and sometimes now). At least not the way Andre Norton did. She used the backdrop of science fiction to talk about race, gender, and other issues. She wrote about people (even if they were alien to each other) who learned to get along, resolve differences, survive together, and even learn to respect if not love each other. Andre Norton’s writing inspired me to study and write science fiction. Her persistence to find a way to succeed and thrive in a masculine publishing world led her to become the Grande Dame of Science Fiction. And I studied the genre. Course credit for reading science fiction? Heck yes! Then, in graduate school, I had to choose a topic for my master’s thesis. Andre Norton was the first person I thought of. She was the perfect topic for my thesis: The Quest for Harmony with the Other in Andre Norton’s Young Adult Literature. I even had an extra copy bound so I could send it to her as a gift, as a tribute. Sadly, before I figured out how to do that, she passed away. Today, my master’s thesis (written 21 years ago) has been scanned and published on a website devoted to Andre Norton—her life, her works, and all things written about her. I’m honored and thrilled to have it included on the site. I wished she’d been able to read it. Now, everyone can read it. Here’s the URL and link if you’re interested: http://andre-norton-books.com/index.php/17-biography/675-articles-about-andre-1995-to-1999. It’s about 121 pages. Your turn. Who’s your favorite author and genre? I’d love to hear your stories of how an author or book inspired you.